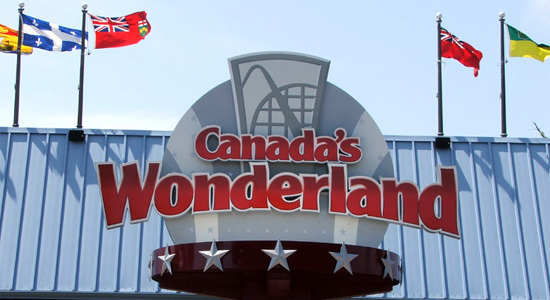 We drove directly from our hotel in Muskegon, Michigan to Canada's Wonderland outside Toronto. It's a beautiful theme park with a great collection of rides. Only Cedar Point has more roller coasters. We started at one end of the park and worked our way towards Behemoth. Thunder Run was a good surprise. A family coaster built mostly inside a manmade mountain. It was my first powered coaster ever. The twists and turn in the darkened tunnels with flashing lights really make the most of this small coaster making it a fun and unique experience. I was also looking forward to riding Skyrider because it is an exact copy of the now defunct King Cobra at Kings Island. It was fun reliving those old memories of my first standup coaster. Another ride I wanted to experience for myself was Sledge Hammer. I had seen it on the website and on YouTube and it just looks wicked. In fact, I was a little nervous about it, afraid that it would make me sick. It turned out to be one of my favorite rides. Sarah and I ended up riding it a good bit over our two days in Canada. Spins, huge elevation changes, airtime, big drops and lots of surprises. A great ride. The final coaster of the day was Behemoth. Sarah chose not to ride. Instead, she got in a few more rides on Sledge Hammer. The first thing I was looking forward to on Behemoth was the unique seating arrangement. Alternating rows of narrow and wide pairs of seats. The wide rows give the best feeling of how high the coaster is. Next comes the steep lift hill. 230 feet. Followed by the great 70-degree drop. An airtime hill, a great turn around, more airtime hills, a helix and even more airtime hills. It is so fast and oh so smooth. I love it. I think I have a new number two favorite coaster of all time. We had beautiful weather and a large crowd at the park. Most of the rides had 10 to 20 minute waits. A couple of the rides were near walk-ons. The longest wait of the day was 30 minutes for Behemoth. Tomorrow... more rides at Canada's Wonderland.